We all have a keyboard on our computers but now you can get this Stream Deck as a great addition to your workflow. The Steam Deck from Elgato comes in a 6 and 15 key version and those keys are not just normal keys they are LCD displays so they can show an icon you like and they can even update stats like how many people are watching your lifestream. You can program all 15 keys and gives it instructions you like. For instance, you can give it a complete tweet or a bunch of instructions that need to be done together. 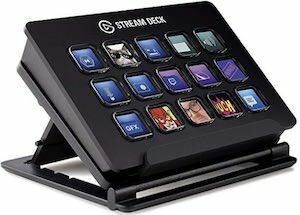 You should and come dee the video to get a better idea about this great Elgato Stream Deck Keyboard. If you are crazy about waffles and a bit of a computer geek then this waffle maker is what you need. This waffle maker does not make the typical waffle, it does make a waffle that looks like a computer keyboard. And as keyboards are bigger than most waffles that means that your waffles will be bigger too. The keyboard waffle maker can make waffles that are 10 x 3.5 inches and they are 1-inch thick. You can use this waffle maker with a gas or electric stove, grills, hotplates, and even a campfire. 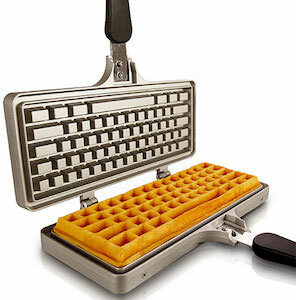 So get ready and make waffles for breakfast with this Keyboard Shaped Waffle Iron. 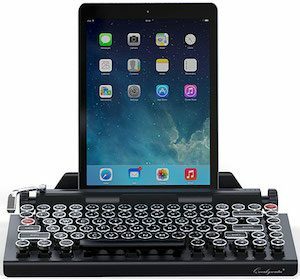 If you like the feel of a classic typewriter but are sick of typing on paper instead of your computer or tablet then you are in luck as this keyboard can bring that feeling to any devices that can use a Bluetooth keyboard. The Qwerkwriter brings the look of a classic typewriter to you and the mechanical Cherry keys are just perfect for typing for hours on end. And this Bluetooth mechanical keyboard has a build in rechargeable battery that will get your to a month of typing before it needs a charge. 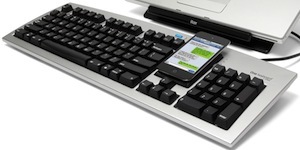 Just imagine having this keyboard on your desk for use with your PC or Mac or just use the build in tablet stand to type on that. Come and check out this Qwerkywriter Retro Bluetooth Keyboard. Would you like to type the classical way on a real typewriter? Now you can get this Underwood F 19030’s typewriter that still works like it did in the olden days but this one also works as a USB keyboard for your PC or Mac and can even work with and iPad. This typewriter would look stunning in your office and just imagine the looks when people see you type away your emails with this classic machine. 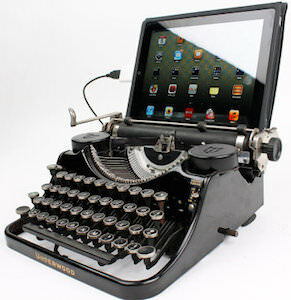 Paper or electrical this type writer is perfect for you. And it even gives you access to the special keys so that you have the full keyboard controls you need in a 1930’s package. Come and take a closer look at this Typewriter Computer Keyboard. Why get a boring box to store things in? If you are a bit geeky like me then you are gone love this key that is a storage box. Yes it looks like a big key from a keyboard and it has the @ sign on it but inside there plenty of room for you gadgets, wires and many other things. 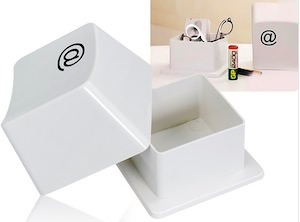 So if you want to clean up you desk then lets store stuff in this Keyboard Key Storage Box. It’s fun and maybe a bit geeky. This is a chart of how to use a keyboard. It explains what keys do what based on the picture of an really old fashion keyboard. This poster is 17 x 22 inch and is a great way to decorate your room or to use in computer class. 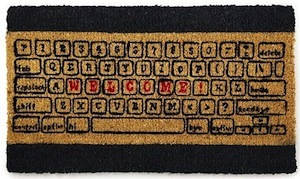 What ever you think it is useful for this fun keyboard chart will make people stare. 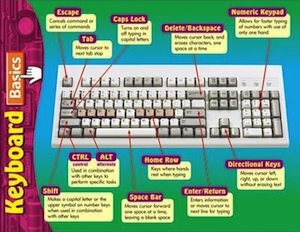 Come and have a closer look at the Keyboard Basics Poster. Drinking a glass of wine is one thing but finishing the bottle is a totally different thing to do. But not worries we found a geeky solution to keep the wine fresh and secure in the bottle and still look geeky on the outside. Bottle stops in the shape of computer keys. They come in a set of 3 and each key has a different message. They can say End, Esc or Save and look just like a regular key from your keyboard. And they fit perfectly in a wine bottle. 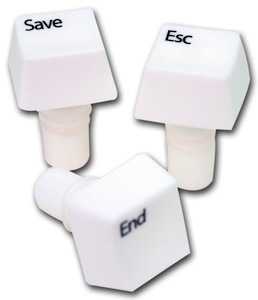 So if you need bottle stops then check out this set of Computer Keys Bottle Stopper. Notebooks are nice but most of them do not have the number pad on their keyboard. But now you can replace your mousepad with a device that could do that for you. This mousepad is of course a mousepad but on the left side is a number keypad witch you connect to your USB port of your computer and to ad a bit more fun to this mousepad they even put a 3 port USB 2.0 Hub in it so that you could connect a wired mouse or a USB flash drive to it. I have to say this mousepad with build in number pad could be the best idea i have seen in a while. Come check out this Mousepad With Number Pad And Hub.